What's in a name? Plenty unfortunately! "What's in a name?" She went on to answer herself "That which we call a rose/By any other name would smell as sweet ..."
Little did Shakespeare know what problems a name can cause! 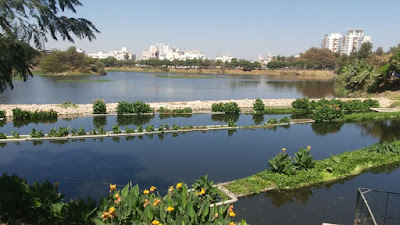 Our little 13 acre lake is called Puttenahalli. So is the 31 acre one in Yelahanka! 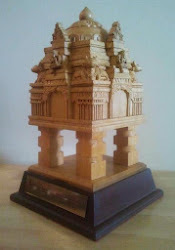 To compound matters, the one in Sarakki is also occasionally and mistakenly called Puttenahalli. Three lakes with the same name is two more than necessary. Truly confusion worse confounded. As if our struggle to nurture our little "Puttenahalli Puttakere" as it was earlier called, is not enough, we are constantly explaining this name jumble to people. We can do this with individuals but how do we address this issue when the mistake occurs in the newspaper? Those few reporters who are aware of this, are careful in specifying which one by writing "Puttenahalli Yelahanka" or "Puttenahalli, J.P. Nagar" (which will still clash with the Sarakki lake but this cannot be helped). If, however, they do not give precise direction to the photographer, then it is very likely that a photograph of our lake will accompany the report on Sarakki or Puttenahalli Yelahanka lakes! This is perhaps what happened in the report which has appeared in The Times of India today. Do we change the name of our lake? Will it help at all since it appears that our lake is so "well known" that any mention of Puttenahalli, it is ours that rises to the mind? Please give your suggestions on how to resolve this name muddle once and for all. We are fed up of explaining which lake is being referred to orally or in print. Since the report in today's newspaper is based on KSPCB data, we would like to add that we continue to feed our lake with the surplus treated water from the STP of an apartment complex. This was a pilot project approved by KSPCB in May 2015 which has led to our Puttenahalli thriving and teeming with fish. It doesn't stink either. These are enough indicators to reassure us that our lake is in good health. 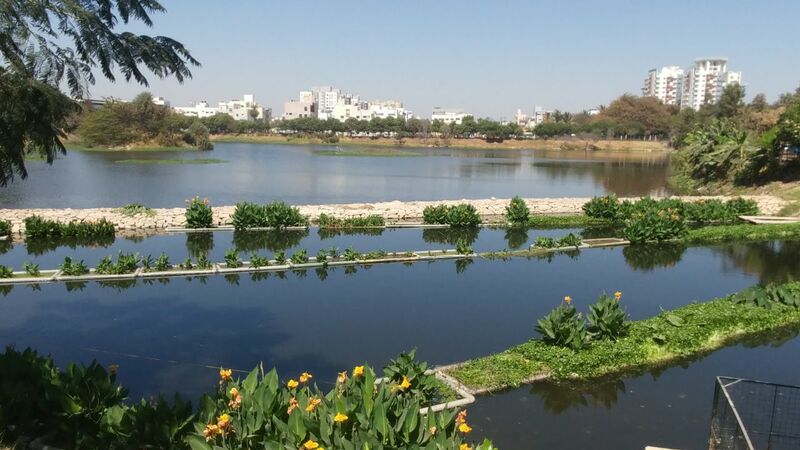 If you will believe only what you see, then please visit our lake - Puttenahalli, J.P. Nagar 7th Phase next to Samskruthi Brindavana and MLR Convention Hall. 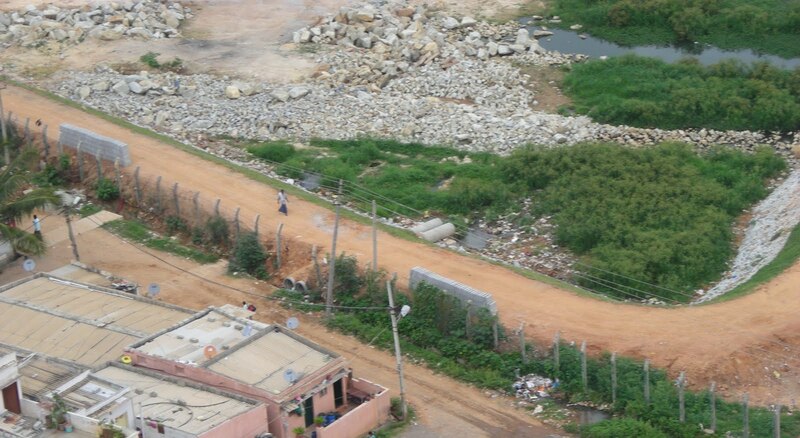 Will Bangalore run out of water? A recent article on the BBC website listed 11 cities worldwide, most likely to run out of drinking water, like what has already happened at Cape Town (South Africa). The article can be read here. Sao Paulo (Brazil) is at No. 1, and Bangalore is at number 2. 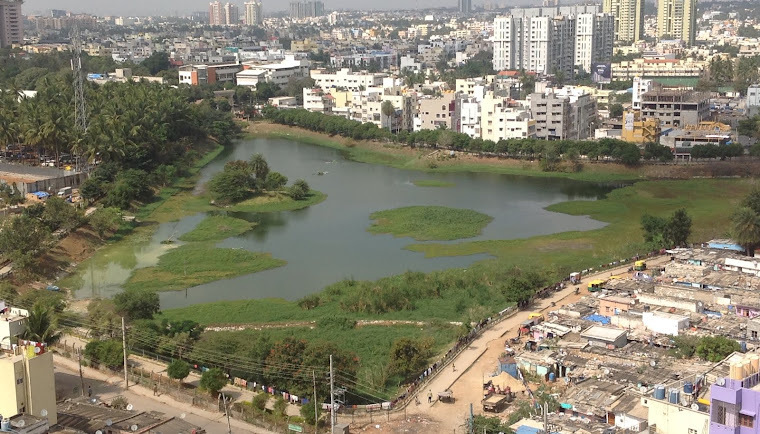 Mr Vishwanath, one of Bangalore's water experts has written a rejoinder article that can be read here, explaining why Bangalore is unlikely to go dry as predicted. While it is comforting to read, we cannot afford to be complacent or indifferent. Water scarcity is real, frightening and imminent if we do not act, not just in Bangalore, but wherever we live. Harvest rainfall. Save water. Save lakes! 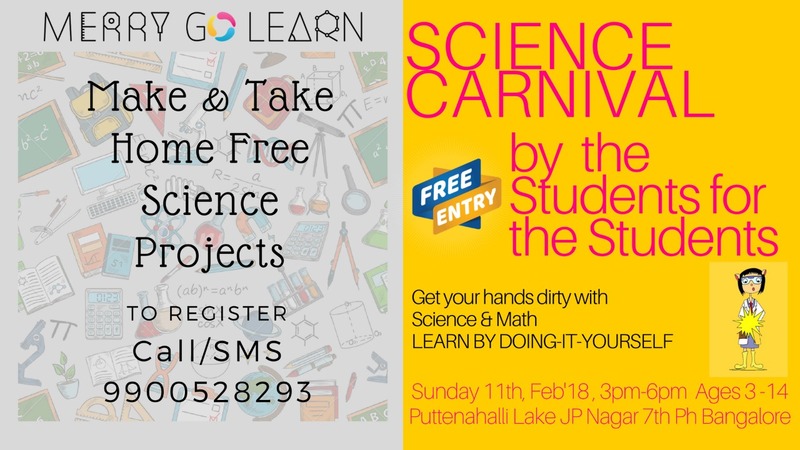 Merry Go Learn, JP Nagar is back at our lake with a bang!! 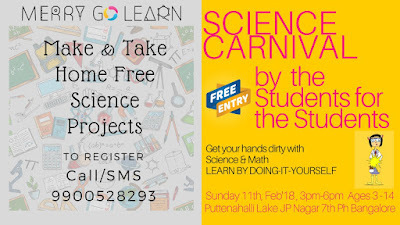 This time they are planning a Science Carnival where kids can have hands on experience on various experiments. 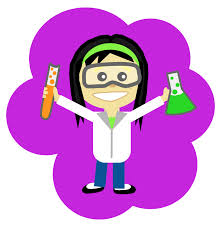 Come and see the magic of science at the stalls managed by the students of Merry Go Learn. ALL ARE WELCOME! ENTRY FREE! World Wetlands Day is celebrated on 2nd February each year in order to raise public attention on the vital role wetlands play in reducing flooding, absorbing excess water, supporting life organisms, improving the water quality, etc. Unaware and indifferent to this, wetlands especially in urban areas are considered as waste land that can be built upon. 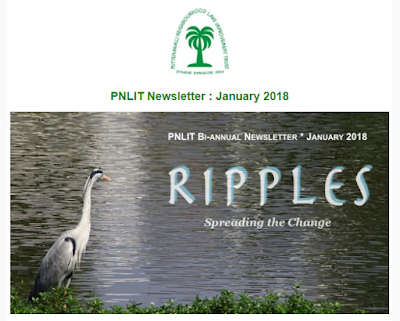 The theme for this year is 'Wetlands for a sustainable urban future." We look back at the wetland in our lake. Given that the water area is only 10 acres, the wetland is less than an acre. It is separated from the main body with a line of boulders about 7 ft high. Four rainwater inlets and an STP line are located in the wetland. For several years we tried to avoid looking at the wetland simply because we didn't know how to maintain it. 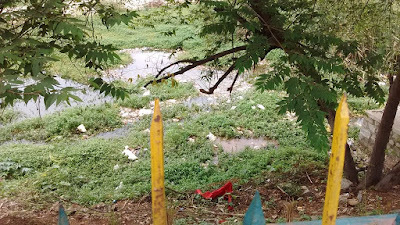 It was overgrown, littered with all sorts of stuff, some of which entered with rain water and the rest thrown in by an indifferent public. But closing one's eyes or ignoring a problem doesn't make it go away, does it? Towards the end of 2016, we decided to revamp the wetland. You can read about our project here. The photographs show the evolution of the wetland in our Puttenahalli Lake from 2010. No marks for guessing which is now our favourite spot at the lake! Spare a thought to water, to wetlands!